Forget Disneyland while you’re in Anaheim for NACE and CIC Week. 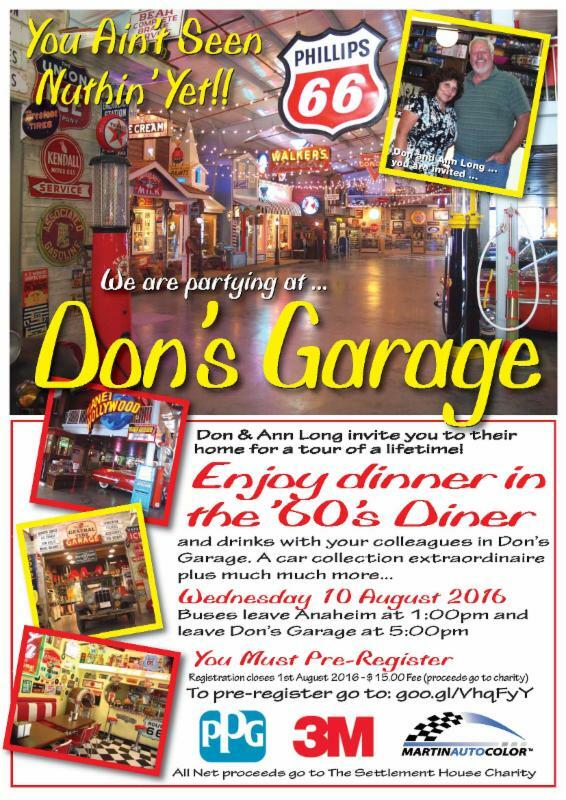 Register today for a trip to the SEMA Garage and the nostalgia-laden Don’s Garage. The Society of Collision Repair Specialists promoted the two Aug. 10 trips on Tuesday as a double-header for visitors to the August conventions. The organization will also hold an open board meeting that week Aug. 9, just prior to the Collision Industry Conference Aug. 9-10. The SCRS-PPG-sponsored SEMA Garage tour will give participants a look at the 2-year-old facility, which features the equipment, space and even three helpful full-time engineers to help a modder build, photograph or film virtually anything. Besides the studio equipment and a fully-loaded garage, gear on-hand includes a California Air Resources Board-recognized emissions lab, a Fortus 450mc Stratasys 3-D printer and a FARO Edge ScanArm laser scanner. The SEMA Garage will also be the “movie studio” for some of what SCRS ultimately plans to be a library of videos intended to illustrate various collision repair concepts to shops, insurers and customers. “Whether you are just into vehicles or you manufacture products, tools or anything else for the industry, the SEMA Garage is a destination to see, and SCRS wants to give you an all access tour to meet and greet with industry leaders, learn a bit more about how the industry benefits from a resource like the garage, collaborations between groups like SCRS and SEMA, and to enjoy some food and beverage among friends,” the association wrote in an email invite. Prior to that, repairers can also take a trip to “Don’s Garage,” which National Collision Repairer described as “Disneyland for the car enthusiast.” It’s an epic collection of classic cars, nostalgia and memorabilia owned by Don and Ann Long, according to NCR. Sponsored by PPG, 3M and Martin Auto Color, all proceeds from the trip go to the Settlement House charity. A bus will take visitors to Don’s Garage from the Anaheim Marriott at 1 p.m. and return them at 5 p.m. Shuttle will also leave the Longs’ and the Anaheim Marriott at 3:30 p.m. for those taking the SEMA Garage tour. Cost: A flat fee of $15, whether you attend one or both events. Free if you drive yourself. Details: Jeff Hendler, 509-539-5629 or jeffhen@gmail.com.